Fire management is the key to maintaining this ecosystem, which is habitat for many endangered species and provides many ecosystem services. 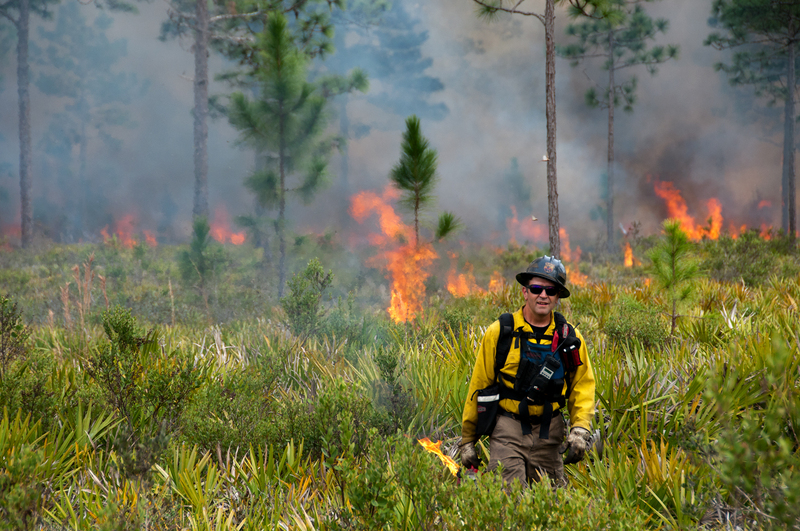 An adaptive management partnership between the Nature Conservancy and Eglin Air Force base (which contains the largest remaining area of longleaf pine savanna), used a participatory modeling approach to develop an integrated model of long term forest dynamics, and evaluate alternative fire management strategies. Over five years, this process led to a new understanding of historical and current fire dynamics. Some key findings were that forest areas need to be burned more frequently, that policies to protect old trees were doing more harm than good, and that policies that work with fire and vegetation feedbacks could greatly improve the efficiency of prescribed fire. The creation of clearly understandable simple models of fire vegetation dynamics, and possible future pathways, enabled this understanding to be translated into new policies and practices. This resulted in the development of new ecosystem management policies and decision support tools to manage fire as well as maintain and enhance the longleaf pine savanna.